New flagship of the range, the 51.9 Allures innovates with its full-beam aft owner’s cabin for unmatched comfort. This new model disrupts the codes of the yard also outside with its large cockpit of 6 meters long with sunbath and swim platform for exclusive comfort and a navigation space that can be protected by a hard top to navigate in any security. This 3rd generation sailboat, following on her big brothers, the Allures 51 and Allures 52, incorporates 15 years of studies by the shipyard and feedback from the owners. She combines comfort, performance, safety and manoeuvrability for a short-handed crew. What could be better than a magnificent boat which is as functional as she is comfortable, to set off on a blue water cruise to discover the world. 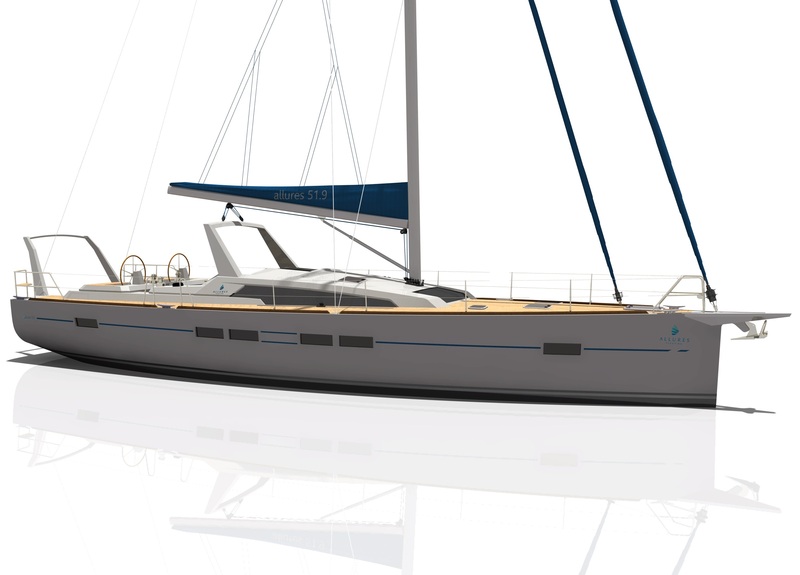 The Allures 51.9 is part of the very selective category of prestigious sailing yachts. An ambitious and innovative project that was made possible thanks to the combination of the know-how of our craftsmen, talented designers and of course experienced sailors who share with us their valuable feedback. You dreamed of a sailing boat with unique elegance and performance, a sailing boat whose sharp design would disappear behind its simplicity of use, a sailing boat on which you could live fully in total freedom? With the Allures 51.9, designers were given the task of bringing Allures Yachting into the prestigious world of the ocean cruising yacht. If all the functions usually required are found on such a boat in general, and more particularly on an Allures of course, then an increase in length makes it possible to even offer more. More performance at sea thanks to an increased waterline length. More comfort thantks to a large cockpit and easy access to the side-decks, a large sunbathing area and a retractable bathing platform on the sugarscoop. More protection with an optional rigid bimini to secure the watchkeeper in all condition. And more hergonomics with station grouping all the manoeuvres necessary for sailing with a reduced crew, in particular thanks to the positioning of the winches near the helmsman. And a saloon modulating ‘lounge’ with a wide bench and a chart table meridian. The Allures 51.9: for those who are demanding more than just an excellent blue water cruising boat.